A problem from the first decade of this century, torque converter faults can be quite variable and require accurate evaluation. First a little history and description. Inside a torque converter is a fluid coupling which transfers rotating power between the engine and the transmission. Inside are 2 sets of vanes, the impeller and the turbine, which transfer power through the fluid by spinning very close to each other. This allows the engine to idle while at a stop when the transmission is not turning. The vanes let the engine run at a higher rpm than the transmission, which allows the engine to produce and transfer more torque, which is the twisting force. The increase in torque is created by a third set of vanes called the stator, which has a smaller diameter and is located between the two main vanes. Rather than trying to explain, we include a short 4 minute video which helps conceptualize the basic functions of a torque converter. 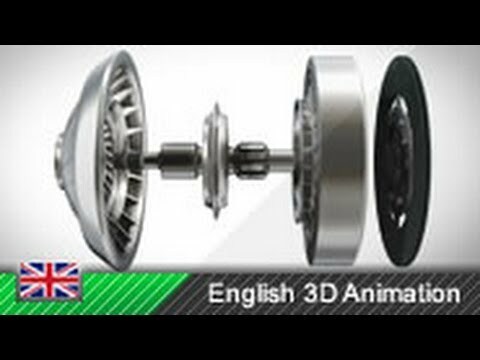 A YouTube video animation by Green Translations which shows the basic parts and explains how a torque converter works. It can be seen that the torque converter is going to waste some amount of energy proportional to the force and the amount of slippage, which is going to cause a loss of fuel mileage as well as heat up the fluid. So at high speeds when the vehicle is cruising and torque multiplication is not needed, a lockup clutch inside the torque converter directly connects the engine to the transmission. The first versions in our fleet in the early 90’s simply locked solid all at once, often with a bit of a clunk. Within a few years, the design for lockup clutch engagement became progressive and smoother. When the TCU requests the torque converter to lock up, it feeds an increasing milliamp signal to a solenoid on the valve body that restricts the fluid flow coming out of the torque converter lockup clutch, increasing the pressure. As clutch starts to engage, the engine speed and transmission speed get closer together, then the milliamps rise quickly until the lockup clutch fully engages. The lockup clutch stays engaged during light throttle increases, but a major acceleration request from the pedal will unlock the lockup clutch and/or downshift to a lower gear. The transition from unlocked to fully engaged needs to occur within a certain range of time and rpm change, or else a code gets generated. Most torque converter failures cause the yellow MIL Check Engine Light to come on, and the OBD-2 code P0741 (VAG code 01192) in the Engine Control Unit (ECU) which names the torque converter lockup clutch. Many times the customer has not noticed anything unusual. That is because most faults are set when the lockup clutch engages too slowly, but eventually works. Sometimes the clutch may slip each time the driver lightly presses the accelerator, and uncommonly the clutch may always slip or not engage at all. So the code does not delineate how bad the problem is, although in cars made after 2005.5, a TCU may generate an alternative code if major slippage is detected. The system that engages the lockup clutch is a set of passageways that feed transmission fluid to the lockup clutch assembly inside the torque converter and control the buildup of fluid pressure with a solenoid on the valve body. The failure modes vary with age and model. A seal inside the torque converter can leak, causing the pressure to be slow to build up. The lockup clutch itself inside the torque converter may be damaged and slipping. A sticking or leaking lockup clutch solenoid or wear in the valve body can interfere with proper fluid pressure control. Low fluid line pressure from the main pump circuit might be responsible, but the transmission would generally show other shifting symptoms as well. A technician with training and a computer can usually identify and quantify torque converter lockup clutch issues. A measuring block generated by the TCU will give values as to whether the lockup clutch should be engaged and the amount of slippage at any given moment. Slipping over 15 to 30 rpm under light acceleration when the clutch should be locked up is about the limit. Any slippage while cruising is wrong. Some vehicles give us more information, like the voltage, duty cycle, or current to the lockup solenoid. In most cases, the factory maximum for slippage is just over 200 rpms. Determining the difference between a slippage problem inside the torque converter versus a sticking valve body may well require extensive diagnosis including a leakdown check of the lockup clutch hydraulic system. Special tools, training and several hours of time are required for these tests. Diagnostics can be expensive and ultimately inconclusive. Old and worn transmissions may well have more than one thing wrong. An electrical issue with the solenoid, wiring or circuit board will have its own code to that effect in most vehicles. Solenoids can be tested for resistance values and the current mapped and checked. The circuit boards are the plastic PC board inside the transmission, which can get brittle and damaged by old transmission fluid. Rarely, the Transmission Control Unit (TCU) may be damaged, possibly by hooking up jump cables backwards, or grounding out some large unfused positive wire. Most of the problems with codes indicating slippage faults are due to failed torque converters. Now the issue really is whether or not it is worth it or absolutely necessary to replace the torque converter. If the code occurs due to slight slippage, but the torque converter is working most of the time, we may advise not replacing it. If the transmission fluid is full of metal flake or large chunks of friction material, then the transmission may be close to failure, and should just be replaced or rebuilt. If the torque converter slips constantly or consistently, there are no other shifting problems at all, and the fluid does not show evidence of internal transmission damage, then the torque converter may be worth replacing. One needs to juxtapose the cost of torque converter replacement against the value and future of the vehicle. As mentioned, a torque converter test may show that the lockup clutch is working normally, but that the lockup time is just a bit past normal, and occasionally the MIL comes on with a VAG 01192 / P0741 code. Since the transmission electronics are adaptive, it may help to reset the adaptation tables by disconnecting the TCU for at least half and hour, which allows the internal capacitors to discharge and the TCU literally starts from scratch with all shift points including torque converter control. It’s a long shot only worth taking if the tests show the torque converter locking up normally. Rarely, a torque converter fails in such a manner that the lockup clutch will not disengage, a dampener spring breaks, or a vane gets badly damaged. Then the engine gets stalled when the vehicle comes to a halt. Very occasionally, the engine will run, but the severely increased drag or damage may cause the vehicle to shudder when slowing down and may require the driver to keep the brakes pressed hard to keep the vehicle stopped. Beware that the brakes may loose power assist as the engine may need to keep the throttle plate opened to maintain idle, which can cause vacuum loss and consequent loss of power assist. Generally this failure is mechanical and will likely cause metal flake in the transmission fluid.